A trauma-informed approach in school settings is useful as trauma can affect the brain in ways that interfere with one's ability to think clearly. "Tim, keep your hands to yourself, your feet flat on the floor, your mouth closed, and your eyes on me. I've told you this over and over. Now do it! If you make another sound, you're going to the principal," Tim's teacher, Mr. B, exclaims, exasperated. He sees the other kids in the room rolling their eyes and hears snickering. Mr. B. is in his fifth year of teaching and feels tired, disheartened, and frustrated. Maintaining order among the 23 students in his third-grade classroom is a constant challenge; it seems that every student has some sort of unidentified special need. "How am I supposed to teach these kids when they come to school sleep deprived, distracted, poorly nourished, and heaven knows what else?" he wonders. "I got my master's in education because I love kids, but now I find myself yelling at them in futility." He sits down at his classroom computer and sends the school social worker a quick e-mail: "I can use another consultation on Tim. The behavior management plans we worked out just aren't doing it." Students, teachers, school administrators, staff, and social workers are all affected by multiple demands, pressures, and scarce resources. Both adults and children come to school with unique personal histories that often include experiences with trauma. A trauma-informed approach in school social work practices can be useful, as traditional behavior management protocols and educational approaches, even when skillfully designed and implemented, may not work when trauma is involved, because trauma can affect the brain in ways that interfere with one's ability to think clearly. Typically, the traumatic experiences that children and adults bring with them to the school setting aren't identified, recognized, or addressed, which can lead to a dysfunctional circular process of mutual retraumatization in school. Hence, an approach to school social work intervention that recognizes how widespread trauma is, the role trauma may play in students' academic, social, and behavioral performance, and how trauma may color how adults respond to students' trauma reactive responses, opens up a wider range of promising, evidence-based, effective interventions. We now know a great deal about how trauma affects learning and behavior in schools. A national sample found that in one year, more than 60% of children were exposed to some form of abuse or violence (Finkelhor, Turner, Ormrod, & Hamby, 2009). In short, it's reasonable to assume that a majority of students in school have been exposed to at least one traumatic event at some point in their lives. People experience trauma when they experience or witness an event that presents a real or perceived threat to well being or safety, and the event causes the person to feel fear, horror, or helplessness. According to this definition, many people today have experienced trauma, as traumatic situations need not be limited to florid experiences such as domestic violence; physical or sexual abuse; or violent crime, but may also include betrayal of trust; physical or emotional neglect; a caregiver's life-threatening illness; bullying; shunning or exclusion; automobile accidents; seeing TV news about violence; painful or intrusive medical treatment; hearing threats of terrorism; poverty; discrimination; frequent moves; separation from primary caregiver(s), parent(s), or sibling(s); and school problems (National Child Traumatic Stress Network, 2013). Traumatic events bring on strong feelings that may strain a person's coping capacity. Children who've experienced trauma may have challenges that affect their social and academic performance at school, including, for example, difficulty sustaining attention, concentration, and completing tasks; difficulties with language and fine motor skills; relating to others; empathizing; regulating their mood and affect; misinterpreting others' motives and intentions; impulsivity, oppositional behaviors, aggressive behaviors toward others; self-injurious behaviors; sleep problems; anxiety; shame; poor self efficacy; dissociation; somatization, or illness. The child's misbehavior may not be intentional at all, but rather an involuntary discharge of body tensions of which the child is totally unaware, as traumatic stress is stored in both the body and the mind (Steele & Malchiodi, 2012). As a result of trauma exposure, a child may experience ongoing intrusive thoughts, intolerably uncomfortable physical sensations, intense arousal, numbness, or avoidance. Common responses to these phenomena are "fight, flight, freeze": to become combative, immobilized, flee, or withdraw. When the child's limbic system is highly activated by trauma triggers in school, the prefrontal cortex responsible for rational decision making, problem solving, impulse control, anticipating consequences, and learning by cause and effect is overwhelmed. Hence, calming the child and enhancing the child's feelings of safety in the present moment are essential in order to avoid escalation or shutdown. Trauma-informed responses in school avoid the unproductive, endless cycle of misbehavior, punishment, more misbehavior, and more punishment (Blaustein & Kinniburgh, 2010). In short, often school personnel may see youths' noncompliance in school as willful disobedience when in fact apparently capable youngsters are unable to activate their prefrontal cortex. The adults' efforts to get the child to perform may unwittingly exacerbate the problem the adults are trying to solve. Child and adult may both be locked in a self-perpetuating downward spiral, continuously triggering each other in a loop of mutual frustration, anger, alienation, and despair. What the child needs in the hot moment of misbehavior is a warm, nurturing, empathic response that facilitates a positive, calming, safety-enhancing emotional attachment to the adult. But, understandably, what a teacher may be feeling in that moment is, "I just need you to stop disrupting my classroom and start learning! Give me a break!" A trauma-informed approach helps disrupt the dysfunctional self-perpetuating pattern and opens new possibilities for change by using disciplinary methods that convey warmth, empathy, and safety, while teaching the child emotional self-regulation and distress tolerance skills. All of this can be done at the same time that the adult uses clear, consistent limits and natural, logical, nonpunitive consequences. Empathy and firm discipline are not mutually exclusive. A typical school day is filled with many ordinary possible trauma reminders that may trigger a child's withdrawal, dissociation, or misbehavior. For example, kids playfully wrestle during recess; get jostled in crowded hallways; hear teachers angrily scolding; see classmates cry; witness shunning or bullying; hear name calling, insults, shaming, or blaming words; and experience other possible trauma reminders. These triggers can produce overwhelming distress in a person who has experienced trauma. Teachers, staff, and administrators in a trauma-informed school are trained to both recognize and respond, using a collaborative team approach, to the effects of traumatic stress on children, parents, and colleagues, using evidence-based practices available through organizations such as The National Child Traumatic Stress Network (www.nctsn.org). Recognizing that a safe school is a protective factor (Ryan, Testa & Zhai, 2008), a trauma-informed school fosters students' recovery and resilience, by implementing an organizational culture, policies, and practices that reflect trauma awareness and skills. The intent is to minimize triggering children's trauma responses, and to give children and adults some voice and choice over what happens to them in school. Key roles for the school social worker are to educate both staff and children about what trauma is, how it affects people, and how to cope with it. The school social worker helps schools create effective collaborative networks linking teachers, school personnel, and parents with community agencies that meet families' biopsychosocial needs, and to create, implement, and monitor school policies and procedures that keep children safe from retraumatizing experiences in school. All of this, of course, is a tall order in schools that are under intense pressure to raise students' standardized test scores, as every moment spent on any activity not immediately related to test preparation may seem tangential. However, the trauma-informed educator sees the link between trauma-informed educational practices and students' academic performance. The school social worker in this model takes a comprehensive person-in-situation perspective, intervening simultaneously with the student, teacher, parent, school administrators, policy makers, key stakeholders, and service providers in the community. A sole, narrow focus on the individual student is eschewed in favor of a thorough biopsychosocial, spiritual systems perspective that takes trauma into account. Creating a trauma-informed school culture is an ongoing project, as there are constant changes in every school's student body and staff composition and ample pressures to forgo a trauma-informed approach. The school social worker's role is to be a catalyst, educator, advocate, and mediator as part of an interdisciplinary team focused on cocreating a trauma-informed school culture. The aim is for all adults in the school to speak of each other and to one another with respect and to support efforts at self-care, while holding each other to high standards with regard to dealing with student behavior and academic achievement in a trauma-informed manner. Thus, the school social worker does ongoing in-service training and consultation with all school personnel in how to recognize their own feelings, how student behaviors trigger those feelings, how to interpret students' behaviors as potentially trauma reactive, as opposed to purposefully and consciously oppositional, how to respond to behaviors in nontriggering ways, and how to create classroom environments that foster every student's sense of safety. Such a school maximizes safety by training and supporting teachers and staff to discipline without shaming, blaming, harsh language, name calling, or threats of punitive consequences. Discipline is administered in a matter-of-fact manner and is proportionate; expectations and consequences are specified ahead of time and implemented in a neutral emotional tone, in concert with genuine recognition of the disciplined student's feelings and needs. The trauma-informed school social worker seeks to be a change catalyst, working collaboratively with school and community personnel to provide ample opportunities within the school to relieve stress and discharge tension, by building into the school day moments such as brief recess, cardiovascular exercise, yoga, mindfulness training, listening to soothing music, and choral singing. When school personnel, including the school social worker, focus primarily on the child's cognitions, one can miss what is a sensory process that requires sensory interventions. The body remembers traumatic images and sensations that aren't attached to words, so talking alone doesn't release the person from their grip. Activities such as singing, dancing, drawing, painting, and working with clay may help alleviate internal tension and express emotion. As trauma is held not only in the psyche, but also in the body, nonverbal interventions may be necessary. The social worker shares with teachers curricula and tools that help them teach students to identify their own emotions and bodily sensations, and, for example, how to use different kinds of breathing exercises, calming self talk, passive muscle relaxation, progressive muscle relaxation, and guided imagery. The trauma-informed school social worker and school staff help children differentiate what happened in the past from what's happening now, helping the child see that the current situation is different. While doing so, the social worker and staff consistently validate and empathize with the child's intense feelings, while supporting one another. When intense trauma reminders occur, the adults reassure and comfort the child, while mindfully remaining aware of how this process is affecting the adults, so the adults are able to separate their feelings from the mix, helping to calm one another so they are able to use trauma informed practices in their interactions with the child. The adults recognize that anniversaries, birthdays, and holidays can be trauma reminders, and they help the child, and each other, weather these times. The school social worker's role is to support both staff and parents in these efforts. The social worker also engages parents, maintaining awareness that they too may have trauma in their backgrounds that may influence how they interact with their children. Trauma-informed school social work means including trauma assessment in the process, educating parents, supporting them empathically, linking them with needed resources, and helping parents form support networks around shared concerns. School personnel and parents have understandable, human responses to a child's disruptive or disturbing trauma reactive behaviors. The adults may minimize or dismiss the intensity or legitimacy of the child's feelings, feel angry at the child for making the lives of others more difficult, feel like rejecting or hurting the youngster, withdraw emotionally, or feel incompetent, helpless, hopeless, or dispirited. In a trauma-informed school, adults have permission to vent these feelings in private with each other and get support from one another, including from the school social worker, whose job is to help create an effective interdisciplinary team committed to providing its members with both validation and support. Adults in the school who feel like "losing it" with a child can summon immediate back up so they can leave the situation, use self-soothing tools to calm themselves, and then reenter. These practices are designed to enhance emotional safety. Teachers can be traumatized by their experiences both outside of and within schools, so they too may need the social worker's empathy and support as they strive to identify their own feelings, trauma triggers, unhelpful responses to students, and alternative, preferable trauma-informed responses. Thus, the trauma-informed school social worker must remain cognizant of teachers' needs. This requires social workers to be aware not only of teachers' compassion fatigue, secondary trauma, and burnout but also of their own countertransference and vulnerability to those phenomena. Students, teachers, administrators, parents, and social workers all experience parallel processes regarding trauma. Ongoing discussion of what trauma is and how it affects everyone in the school can be a useful component of reflective supervision. School policies should foster adults' self care so together they can help children develop capacities for functional self-care that promotes learning and social development. 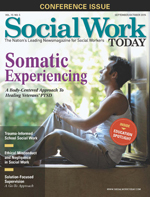 Trauma-informed school social work takes the long view. It recognizes that learning how to cope with trauma may be a lifelong process, and that creating and maintaining trauma-informed schools requires ongoing commitment on many players' parts. The trauma-informed school social worker must implement multiple roles and skills across different size systems. The goals of fostering students' resilience; believing in their capacity for recovery; and developing and nurturing sustained, genuinely empathic attachments with safe adults both within and outside of school aren't easily achieved in stressful environments with scarce resources. This challenging work can be deeply rewarding, as the growing body of evidence on the outcomes of trauma-informed practices shows. Blaustein, M. E. & Kinniburgh, K. M. (2010). Treating traumatic stress in children and adolescents: How to foster resilience through attachment, self-regulation, and competency. New York, NY: Guilford Publications. Finkelhor, D., Turner, H. A., Ormrod, R. K., & Hamby, S. L. (2009). Violence, abuse, and crime exposure in a national sample of children and youth. Pediatrics, 124(5): 1411-1423. National Child Traumatic Stress Network. (2013). Child welfare trauma training toolkit: Participant manual (2nd ed.). Los Angeles, CA, & Durham, NC: National Center for Child Traumatic Stress. Ryan, J. P., Testa, M. F., & Zhai, F. (2008). African American males in foster care and the risk of delinquency: The value of social bonds and permanence. Child Welfare, 87(1): 115-140. Steele, W., & Malchiodi, C. A. (2012). Trauma-informed practices with children and adolescents. New York, NY: Routledge.